Looking for a New GMC Yukon XL in your area? 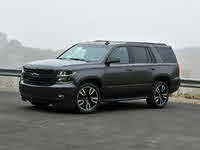 CarGurus has 1,817 nationwide GMC Yukon XL dealers with 27,842 new car listings. For nearly as long as there’s been a GMC Yukon, there’s been a Yukon XL. The models share most content and design, but the Yukon XL has a 14-inch longer wheelbase and more than twice the cargo space of its shorter counterpart. For 2019, it gets a few small updates. Yukon XL buyers can select from two powertrains. A 5.3-liter V8 engine with 355 horsepower and 383 pound-feet of torque and a 6-speed automatic transmission come standard. GMC also offers a 6.2-liter V8 with 420 hp and 460 lb-ft, along with a more-advanced 10-speed automatic transmission. Rear-wheel drive (RWD) comes standard with either setup, while four-wheel drive (4WD) with a two-speed transfer case is optional. The 4WD system gets an “AUTO” mode that engages the backup axle when additional traction is needed. The Yukon XL is capable of towing up to 8,300 lbs with the available heavy-duty trailering package. Fuel economy numbers stand as high as 15 miles per gallon city, 22 highway, and 18 combined on regular fuel for the 5.3-liter, or 14, 21, and 16 on premium fuel for the 6.2-liter. For 2019, the Yukon XL comes in SLE, SLT, and Denali trims. The base SLE trim gets the 5.3 liter engine, 18-inch wheels, projector-beam headlights, remote start, seating for eight occupants, tri-zone automatic climate control, a BOSE sound system, and an 8-inch infotainment system with Apple CarPlay and Android Auto. The available Convenience package tacks on an auto-dimming rearview mirror, power-adjustable pedals, a hands-free programmable liftgate, and a garage door opener. The mid-grade SLT trim includes everything from the SLE trim with the Convenience package, along with 18-inch machined alloy wheels, perforated leather upholstery, power-release second-row seats, power-folding third-row seats, heated and cooled front seats, and a heated and leather-wrapped steering wheel. There’s also an Open Road package, which adds a power sunroof, a rear-seat DVD player, and map-based navigation. For a luxury ride, buyers can go for the top-tier Denali trim. The Denali includes the larger 6.2-liter engine, special chrome exterior accents, a “Denali” egg crate-mesh grille, “Denali” badging, and 20-inch wheels. It gets everything from the SLT trim, along with real wood veneers, magnetic suspension, second-row bucket seats (which reduce seating to 7 occupants), an 8-inch instrument cluster LCD, navigation, a heads-up display, an integrated trailer brake controller, and HID headlights with LED lighting signatures. 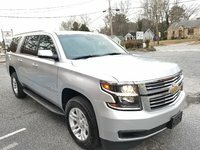 The Denali Ultimate package throws in everything from the SLT Open Road Package, as well as an enhanced security system and premium 22-inch wheels. For 2019, GMC has added three new colors to the Denali palette: Dark Sky Metallic, Pepperdust Metallic, and Smokey Quartz Metallic. There are also two new packages available for the SLT trim for 2019. The Graphite Edition includes special 22-inch wheels, dark exterior trim, and an upgraded suspension capable of handling higher payloads. The Graphite Performance Edition gets the 6.2-liter, an 8-inch instrument cluster LCD, a more-powerful alternator, a two-speed active transfer case for 4WD models, and magnetic suspension. The Yukon XL comes with more than enough content on the safety front. Standard features include a reversing camera and airbags all around, including a unique-for-the-segment front center airbag that deploys between the two front seats. GMC also includes Teen Driver, which allows parents to monitor their children’s driving performance, set limitations, lock out certain features, and even receive emailed report cards. As far as advanced equipment, there’s an Enhanced Driver Alert package, which is standard on SLT and Denali trims, but optional on the SLE. It bundles forward-collision alert, a safety alert driver’s seat -- which provides haptic feedback to the driver-- as well as automatic high-beam control, lane-keep assist, and low-speed forward automatic braking. Blind-spot monitoring, lane-change assist and rear-cross traffic detection are standard for SLT and Denali trims, while adaptive cruise control is an add-on. The Yukon XL was always known for its big footprint, but these days, it is also known for its sophistication, driving pleasure, and creature comforts. What's your take on the 2019 GMC Yukon XL? Have you driven a 2019 GMC Yukon XL? Enter your zip to see incentives for a new Yukon XL in your area. CarGurus has 13,232 nationwide Yukon XL listings starting at $1,995.